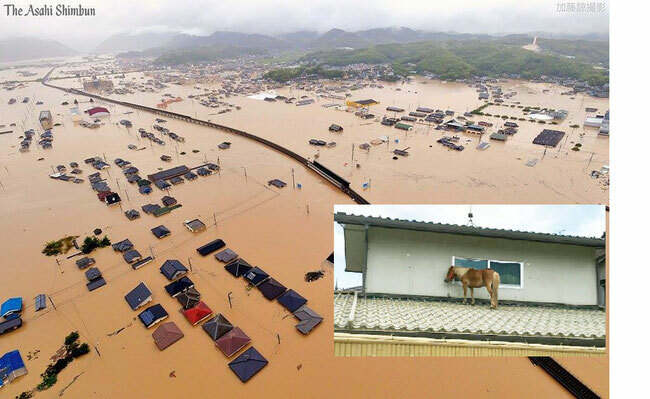 The miniature horse was standing on the house roof for 3 days, which means it dragged itself on to the roof to survive the flood caused by the torrential rain in the western Japan in July. This picture is one of the musts to keep in my PC folder of the pictures and the information regarding the heaviest rain disaster in decades. The holder also includes the picture criticized for the fact that Prime Minister and his party grandees were enjoying the party eating and drinking in the midst of the heavy raining, which has caused the biggest damage in decades in Japan.